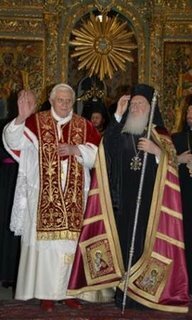 Today His Holiness Pope Benedict XVI met His Holiness Bartholomew I, the Ecumenical Patriarch of Constantinople. The Holy Father's visit was to help heal divisions following the break between the Catholic and Orthodox Churches in 1054 AD. However, unlike protestants, the Orthodox Church also has a valid priesthood and therefore, valid Sacraments. In reality, only Baptism and Marriage are truly authentic Sacraments in some protestant churches. Hi, it is good to see that the Pope is finally getting to the real news that could significantly effect the Catholic Church. Further moves to christian unity can only be a good thing. Thank God there was no serious reaction by the muslims in Turkey. If the had it would have been a serious own goal for the media preception of Islam. 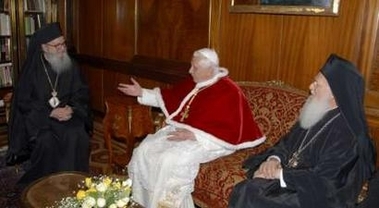 As some have said Pope Benedict is Islams best friend right now! 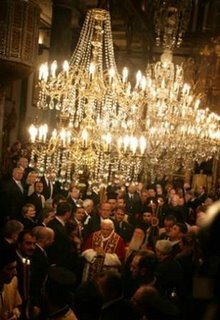 All the sacraments are valid in the Orthodox church? Those are really good pics. I wish that our reunion with our Orthodox brothers happens within our lifetimes. I just read an article on Yahoo about the visit. I've been keeping an eye on things and still praying for him. It mentioned in the article it is a "faux pas" for him to pray in the mosque...why because only Muslims can? I love the Papal garments/vestments here! Can I have some!!!???? Please!!!! Fr. Leonard: I completely agree. Further moves to unity with other Christians is a huge step. We are so close to the Orthodox Community; I hope that we are able to be reconciled one day.